Oil on canvas, 42 x 60,5 cm. 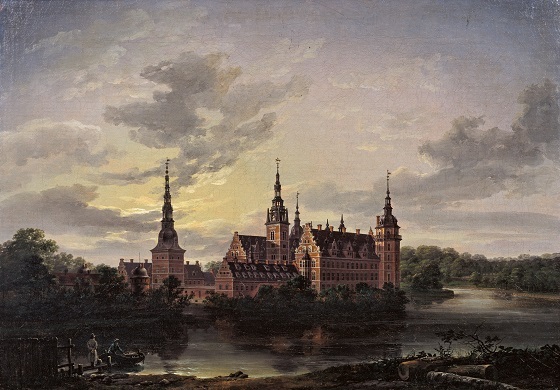 This evocative and melancholic depiction of Frederiksborg Castle by J.C. Dahl is in line with the Romanticist ideals that prevailed at the time of its painting. The contrasts between light and shadow creates an exalted and dramatic composition. One of the people in the foreground appears spellbound by the view. Occupying a central position in the background is Frederiksborg Castle, bathed in moonlight. The painting depicts an encounter between man and stunning natural scenery, which was a favourite theme in Romanticist art and literature. One of the people in the foreground, however, is also looking upon past glories, namely the national monument that is Frederiksborg Castle. By depicting the people of the time against their national heritage, J.C. Dahl illustrates how the past is always interacting with the present.